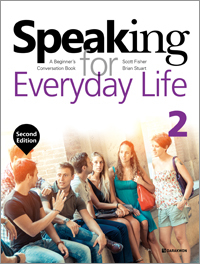 Speaking for Everyday Life 2 – Second Edition은 전 2권으로 구성된 대학 수준의 초급자용 영어회화 시리즈의 두 번째 책이다. Speaking for Everyday Life 시리즈는 한국 학생들을 대상으로 십 년 이상의 강의 경험이 있는 원어민 저자들이 한국인 영어 학습자들이 특히 어려워하는 점들에 초점을 맞추어 개발하였다. 수업 시간에 활용할 수 있는 재미있고 효과적인 다수의 액티비티들을 수록하고 있어, 학생들의 능동적인 학습 참여를 자연스럽게 유도한다. 한국 학생들의 실정에 맞는 스피킹 교재를 갈망해 온 강사들과 자신의 현실과는 동떨어진 수업 주제가 부담스러웠던 학생들에게 Speaking for Everyday Life 시리즈는 영어회화 수업에 놀라운 흥미와 활력을 불어넣어 줄 것이다. Finally! 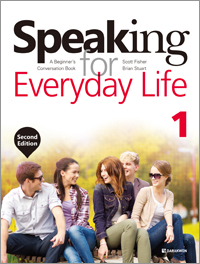 An English conversation textbook that specifically addresses the needs and interests of Korean students! Instead of targeting some mythical international student the authors, with over 20 years of combined teaching experience in Korea, have developed an activity-based course book targeting common weak points and areas of interest and motivation for Korean adult learners of English. The unique approach is to present dialogs, vocabulary, and activities that are related to everyday life in Korea, thus encouraging students to speak about things they are familiar with while having fun with the numerous language and cultural activities included in each unit. Although the focus is on improving speaking skills, additional listening and writing activities are included in each unit. 총 12개의 유닛으로 구성되어 있으며, 각 유닛은 2개의 대화문을 포함하고 있다. 기본적으로 대화문과 그에 속하는 필수 어휘, 상황별 표현, 기본 문법 등을 다양한 방식의 액티비티를 통해 자연스럽게 학습목표 달성이 가능하도록 구성되어있다. 이러한 학습활동은 해당 토픽과 관련된 청취 연습으로 이어지며, Common Mistakes 섹션을 통해 한국 학생들이 가장 많이 틀리는 부분을 연습할 수 있도록 하였다. 영작 연습과 해당 유닛 토픽을 아우르는 Wrap-it-up Questions’ 코너를 통해 전체적인 학습을 마무리 할 수 있다. Each unit starts with a short introductory activity designed to establish the units theme and create a need for the vocabulary and grammar points taught on the following pages. Vocabulary practice and the two dialogs per unit model the expressions and grammar points. Then, most importantly, the students are set free to enjoy the numerous activities that serve to practice the language in a less structured, more natural setting. Wrapping up each unit are listening activities, a Common Mistakes section, and Wrap-it-up’ questions designed to address any remaining weak points, while further improving the targeted listening and speaking skills. UNIT 7. Where Is It? 다수의 책을 집필하였으며, EBS 라디오 co-host, 성신여자대학교에서 강의를 하였다. Bachelors Degree in History: University of Michigan, U.S.